The third of ten children, Smiley was born in Gulfport, Mississippi on September 13, 1964, to Joyce Marie and Emory G. Smiley. At the age of two, he and his family moved to Indiana when his father, an Air Force non-commissioned officer, was transferred to Grissom Air Force Base in Bunker Hill, Indiana. His mother is a Pentecostal minister. Upon graduation from Maconaquah High School, Smiley attended Indiana University, where he was involved in student government and became a member of Kappa Alpha Psi Fraternity. After reconsidering a decision to drop out of college at the end of his junior year, he interned as an aide to Tom Bradley, the first African-American mayor of Los Angeles. Smiley returned to Indiana University after the internship, receiving his bachelor’s degree in law and public policy in 1986. Upon graduation, he served as an aide to Mayor Bradley until 1990. Following an unsuccessful campaign for a seat on the Los Angeles City Council in 1991, Smiley became a radio commentator, broadcasting one-minute daily radio segments, called The Smiley Report, on a Los Angeles radio station. His commentaries focused on local and national current-affairs issues affecting the African American community. Smiley then went on to co-host a local talk show in Los Angeles where his strongly held views on race and politics, combined with his arguments regarding the impact of institutional racism and substandard educational and economic opportunities for inner-city black youth, earned him attention of Newsweek, The Washington Post, and Time with the latter calling him one of the top 50 leaders for the future. In 1996, Smiley became a frequent commentator on the Tom Joyner Morning Show, a nationally syndicated radio show broadcast on black and urban stations in the United States. He developed a friendship with host Tom Joyner, who appeared to share many of Smiley’s opinions on racial matters, and together they began hosting annual town hall meetings beginning in 2000 called “The State of the Black Union” which were aired live on the C-SPAN cable television network. Also in 1996, Smiley became the executive producer and host of BET Tonight (originally BET Talk when it first premiered), a public affairs discussion show on the Black Entertainment Television (BET) network. Smiley hosted BET Tonight until 2001, when the network announced his contract would not be renewed. 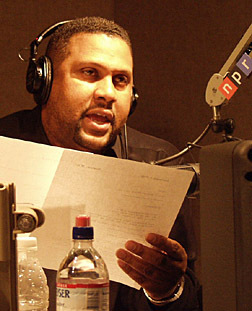 Following his dismissal from BET, Smiley became the host of The Tavis Smiley Show on National Public Radio (NPR). The show ended in December 2004 when he left the network. Smiley is the first American ever to simultaneously host talk shows on both public television and public radio. Tavis Smiley was honored with the National Association for the Advancement of Colored People (NAACP) Image Award for best news, talk, or information series for three consecutive years (1997-99) for his work on BET Tonight with Tavis Smiley. He has received numerous honorary doctorate degrees, including one from his alma mater, Indiana University. In 1999, he founded the Tavis Smiley Foundation, which funds programs that develop youth leaders in the black community. In 2004, Texas Southern University honored Smiley with the opening of The Tavis Smiley School of Communications and The Tavis Smiley Center for Professional Media Studies. Smiley has written or edited a number of books since 1993, including the New York Times best seller, The Covenant with Black America (2006). He currently hosts Tavis Smiley, a late night talk show televised on the Public Broadcasting Service (PBS) network.